Two weeks after the birth of my daughter I googled “newborn baby sleep tips.” I was exhausted and desperate for a solution. I uncovered a lot of baby sleep tips– some good, some not so good. Then I read some books, and then I read even more books, (can you tell I really value sleep??) tried out the tips… and bam! One day I got my baby to fall asleep and stay asleep. I thought it might be a fluke until it happened again and again. And again. 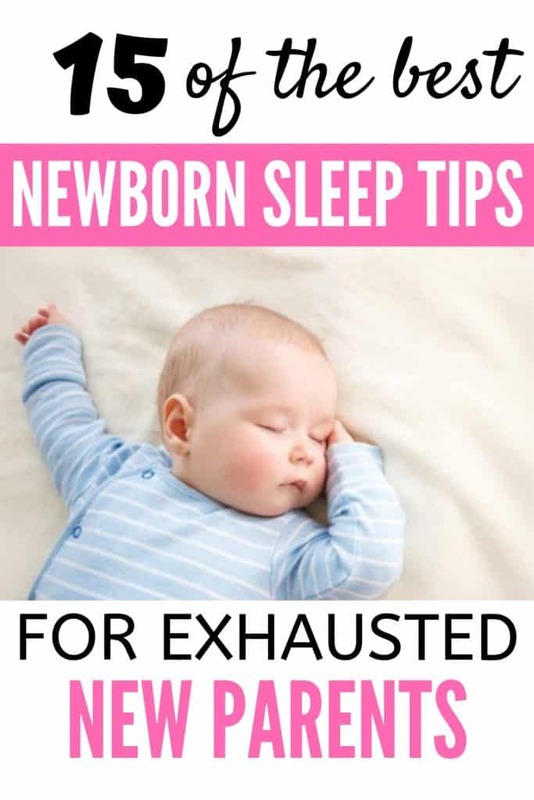 To this day, the newborn baby sleep tips I learned still work and have survived every major sleep regression babies go through. And so from a former exhausted mother to a current one, here are the best newborn baby sleep tips! How much should baby sleep? 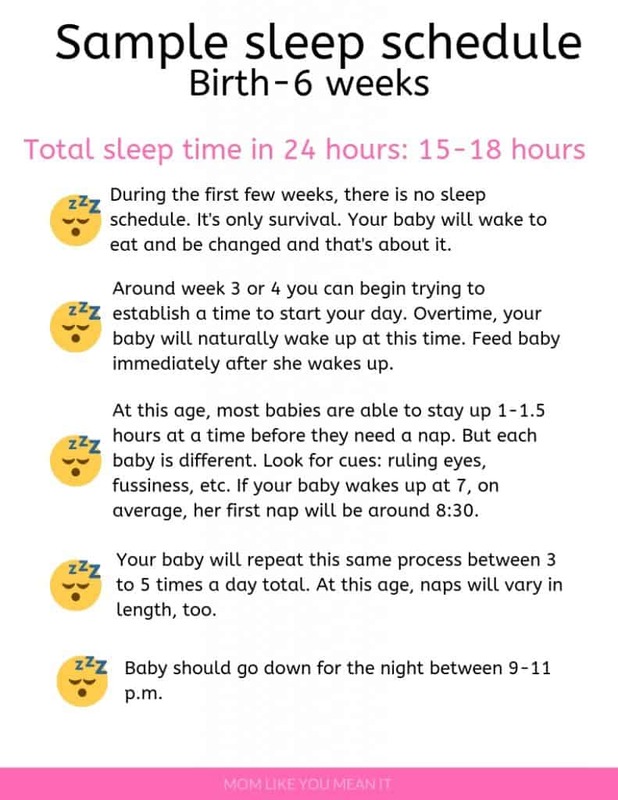 Your newborn will sleep a lot. And in fact, for the first six weeks, your precious little babe won’t do much outside of eating, cuddling, pooping and sleeping. On average, infants sleep 14 to 18 hours a day. Unfortunately for new parents, the bulk of this sleep isn’t exactly done at night; for the first several weeks, you can expect your baby to take long “naps” in large chunks of time. The sleep patterns of babies varies from baby to baby and it will just take some getting used to– your infant might take 2-3 hour naps several times a day, or she might only nap for an hour at a time, taking a lot of naps each day. It just depends. The good news? The extremely sleepy newborn phase typically slows down by the time your baby will reach three months. At 3 months you can expect your baby to sleep 13 hours a day, and by this time, most babies are sleeping for larger chunks at night. During the first week, well, really several weeks, of your baby’s life you’re in survival mode, mama. Forget the housework, forget cooking, forget everything but caring for your little one. You’re on a strict, eat, burp, cuddle, sleep repeat cycle for the next several weeks. If your lucky your little one might come out of the womb sleeping like a champ at night, but for the most part, babies sleep for chunks of time, and most of this isn’t concentrated at night. Ask for help! I wouldn’t have made it if my family didn’t stay with us as soon as we arrived home from the hospital. My husband and I were both exhausted and we desperately needed some rest. Plan to have help during those first two weeks! Throw out the schedule. Don’t stress about the fact that your baby is sleeping sporadically. There will be a time when you can try and follow a schedule, but those first few weeks aren’t it. Sleep when you baby sleeps. Because your baby isn’t sleeping for large chunks at night, you’ll likely find it hard to get a decent night of sleep in. That’s why it’s an absolute must to take cat naps when your baby sleeps. Do not use this time to cook or clean. Just rest! Here are some sleep tips to follow once baby hits about the 3 to 4 week mark. Keep in mind, that this is a loose schedule– your baby’s routine will lend itself to a schedule much better when he hits 6 weeks to 2 months. For the first six to eight weeks baby will likely need a lot of help from you to go to sleep. During this time period, focus on soothing baby as much as possible before bedtime. You’ll probably need to try out many techniques before you stumble upon your baby’s preferences when it comes to soothing mechanisms. Repeat after me, a swaddled baby is a happy baby. I was initially skeptical of swaddling when someone mentioned it to me in passing, but desperate to get some sleep, I caved and tried it out. Swaddling is magical. Not only does it instantly calm babies down, but it also helps them stay asleep longer. Babies are born with the Moro reflex (also known as the startle reflex) which basically triggers baby to quickly outstretch arms in response to a changing stimuli like light or noise. Typically this reflex is guaranteed to wake up baby. But a swaddled baby won’t wake up! Once baby shows signs of rolling over, it’s time to lose the swaddle. Good news though, your baby can still safely sleep swaddled (with his arms out) when you use a sleep sack. I loved using a sleep sack and felt it worked just as well as the swaddle blanket once my daughter was rolling over. Your baby will wake during the night to feed, and will likely be lulled back to sleep after nursing or drinking the bottle. Go ahead and change baby before you feed. Make sure baby is sleeping in a night time diaper, too. This way baby won’t wake because she’s wet. We tried a ton of night time diapers, and I’m a huge fan of Huggies Overnights. Your precious little babe is used to sleeping in the womb, and it’s noisy in there! Recreate their safe zone by using white noise. For the first few months we used the baby shusher, which is supposed to mimic the rhythmic sounds from a mother’s womb. The baby shusher worked like magic each night and very quickly soothed my daughter to sleep. At about 3 months we transitioned to a white noise machine, which we still use today. The white noise machine is a great sleep cue for my baby and works so well that I can vacuum right outside her room without any fear of waking her up! My daughter was a pacifier junkie and offering her one instantly calmed her down. Putting her to bed each night with a pacifier really helped her to settle down quickly. One word of caution about the pacifier: You might consider teaching baby how to keep the paci in her mouth by trying to pull pacifier out of baby’s mouth several times a day. Your baby will naturally try to keep paci in mouth by sucking harder. My baby had an especially hard time keeping the paci in her mouth and would eventually cry out to us several times a night until we would come in and reinster her paci. This lasted for about 3 weeks before we had to take the paci away cold turkey so all of us could get some sleep. Remember when you barely felt baby all throughout the day while you were pregnant, but as soon as you laid down at night it was as if your baby was at a disco? Thanks to your cozy womb, your baby is used to being “rocked” to sleep because of the constant motion they felt in the womb. So if you’re having trouble getting your baby to sleep, try using motion to help. Rocking baby to sleep before placing her in the bassinet or placing her in the bassinet and proceeding to lightly jiggle the sides of the bassinet may work wonders for you. My baby loved when I jiggled the sides of her bassinet and was always happy to fall asleep fairly quickly when I used that trick. A friend introduced me to The Happiest Baby on the Block book and everything started making sense for me. In the book, Dr. Karp explains to parents that ideally, babies need a fourth trimester in the womb. And because of this, your newborn baby functions best when you are “recreating” his life from the womb on the outside. That’s why things like swaddling, shushing, swinging or bouncing and pacifiers are so comforting to a baby-they’re all tools that help mimic life in the womb for a baby. 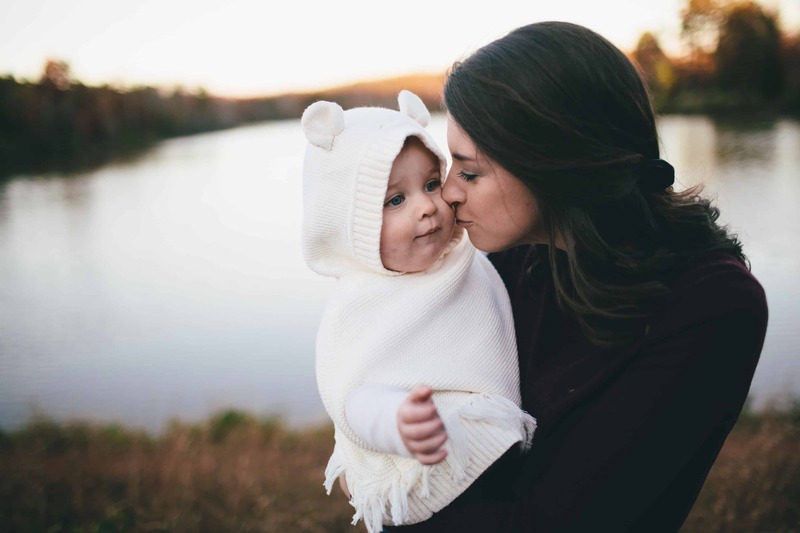 Understanding the fourth trimester not only helped me to understand how to get my daughter to sleep on her own, but it also helped me calm her down when she was overly fussy during the day, too. By the two month mark, most babies are ready to be taught how to fall asleep without a lot of assistance from you. Once the bedtime routine starts keep baby in the same room and try to speak in a low tone. You should be trying to actively wind baby down with each step in the bedtime routine. Keep the same routine each night so that baby knows it’s time to sleep. Keep swaddling baby until she can roll over. Once baby rolls over, transition to a sleep sack swaddle so that your baby will still feel safe and secure when they sleep. This is the step that most parents struggle with, but it’s so necessary if you’re aiming to establish good sleep hygiene with your little one. The idea is to carry out the bedtime routine and place baby to sleep in the crib or bassinet while they’re drowsy but still awake. Because you’re actively trying to teach baby to self-soothe, you don’t want to put baby to down when they’re completely asleep. If you do this, baby will undoubtedly wake later in the night and cry out for you because they’re not where they remembered being when they initially fell asleep. If this does not work, you can try another method– let baby fall asleep in your arms, transfer her to the crib and then wake her up, just barely– enough for her to realize she’s in her own bed. Note: Letting baby learn how to fall asleep on their own is a priceless skill, but it takes a lot of practice. Just keep at it, and your baby will eventually teach themselves this valuable skill. For more information on this and other baby sleep tips, I highly recommend this book. It’s over 250 pages and jam-packed with every sleep problem you might encounter during the first year. If you feed or nurse your baby right before you lay them down to sleep, there’s a good chance they associate waking with needing to be fed. So once your pediatrician tells you your baby is mature enough to sleep through the night without eating, try breaking baby’s feeding association with waking. Accomplish this by feeding baby about 30 minutes before bedtime, so this isn’t the last thing baby does before going to bed. You can follow up the feed with some cuddling, lots of books and by talking with your baby. By the time your baby reaches 2 to 3 months, they’ll transition from sleeping all of the time, to sleeping largely at night with several naps during the day. Each baby is different, and will nap differently, but there are things you can do to help your baby establish good nab habits along the way. But baby down at the first sign of being tired. Your baby’s nap routine can largely be his bedtime routine minus the bath. Be consistent with this routine so that baby knows when it’s time to sleep. Sure, your newborn was able to sleep on-the-go, without any negative repercussions, but now your baby needs way more consistency when it comes to napping during the day. Resist the urge to let baby nap in the stroller or in the car. Don’t put baby in swing for naps and the crib for nighttime. Consistency is key, and sleep location is no different. The amount of sleep your child needs in a 24 hour period changes as your baby grows and matures and also fluctuates around developmental milestones, too. For this reason, keep nap routines fulid and work to pick up on cues your baby is putting off. If they are showing signs of being tired earlier than they typically nap, allow your baby to try and nap. Likewise, if they refuse to go down for their last nap of the day for several days in a row, maybe it’s time to drop a nap. The key is to pick up on your baby’s sleep cues and to be flexible! If you’re a new parent, getting your baby to fall asleep and stay asleep is likely on the top of your to-do list. Just remember, it takes time for newborns to learn how to sleep on their own. Give yourself a break during those first couple months and catch up on sleep whenever baby is sleeping. Later, when baby is older, work to establish good sleep habits by routinely putting baby to sleep on his own. And above all, be consistent with sleep routines!